Letters to Elijah: Always check the date! 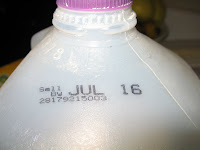 One of the ways I have been saving big money lately is checking the expiry dates on items. You would be shocked how many items have expiry dates. Here is a small list - some of these are obvious.. others, not so much. Check the date - if it's getting close ask for a discount! I found hotdogs that expired the day before I went shopping (the store should have thrown them out) - I got them for 25 cents each. Do you know how many preservativtes are in a hotdog? I threw them all in my freezer. I found perfect pre-packaged brocolli (I don't normally buy pre-packaged veggies) that were going to expire in 2 days. I asked if they would knock down the price - he was happy to - $1.79 to 25 cents! These stores have to throw out expired items... and any money they could have made too! 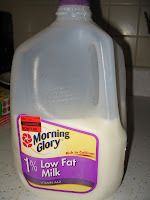 I get milk half price milk 4 days before it is set to expire - it's worth it to check the dates! 1) I just want to remind you to be cautious. Expiration dates are there for a reason. To put it simply, chemicals break down into something else, (ah, chemistry) and because of this, you may think you are buying something when due to natural chemical reactions you are actually buying something else that is potentially harmful. However, to ease your mind, expiration dates are generous. But please throw out the 2-year expired medicines! 2) Who do you ask for the discount? Do you just ask the cashier, go to the service counter, find a manager?